This document represents a developer's guide to JExplorer library. Here you can find all required information regarding the use of JExplorer library in your Java application. JExplorer is a Java library that allows integrating with installed in operating system MS Internet Explorer web browser control into Java application. Integration with MS Internet Explorer is implemented via system native MSHTML library. With JExplorer you can embed MS IE web browser control to display modern web pages. Almost all the examples in this guide can be found in the samples directory of JExplorer Distribution Package. The samples you can also find online. The jexplorer-3.5.jar library contains native binaries. At the first run JExplorer extracts the binaries from the JAR file into user's temp folder. So, Java application must have rights to write to user's temp directory. JExplorer will be supported until June 30, 2019. Commercial licenses are currently not available for purchase, so this section is intended for the users who have acquired licenses prior to June 30, 2018. If you have any licensing questions, please contact sales@teamdev.com. JExplorer library requires a valid license (teamdev.licenses) file for operations. – you need to use the Development license (development.jar) for development purposes only. The number of licenses should be equal to the number of developers who use JExplorer in development. For example, if you have 10 developers involved into your project and only 4 of them work with JExplorer, you should purchase 4 licenses only. – the Runtime license (runtime.jar) should be used when you distribute your software with JExplorer enclosed. For example, you can include the runtime.jar file into class path of your application production version. You can deploy the Runtime license with your application to unlimited number of end users. In order to get information about the license, use the "teamdev.license.info" system property. The following code demonstrates how to enable license info printing in your application. JExplorer integrates with installed in operating system MS Internet Explorer. Microsoft Windows XP (SP2), 7, 8, 8.1, 10, Server 2003/2008/2012, 32-bit and 64-bit. MS Internet Explorer 6, 7, 8, 9, 10, 11. Both 32-bit and 64-bit. Oracle JDK/JRE 1.7.x and higher, 32-bit and 64-bit. JExplorer supports multi-process architecture and runs native code in separate JExplorer32.exe or JExplorer64.exe processes depending on JVM architecture. JExplorer32.exe process is terminated automatically once you dispose the latest Browser instance that belongs to the process. By default parent and child Browser instances are running in same JExplorer.exe process. MS Internet Explorer can display web pages using different versions of Internet Explorer via Browser Mode feature. In JExplorer by default web engine is configured to display web pages in MS IE 7 Browser Mode. Browser Mode is a global setting that is stored in Windows Registry. Once you set Browser Mode, all Browser instances will use it. To remove this setting and enabled default behavior (MS IE7 Browser Mode) use the BrowserFeatures.disableBrowserMode() method. Browser Mode must be configure before you create any Browser instance. 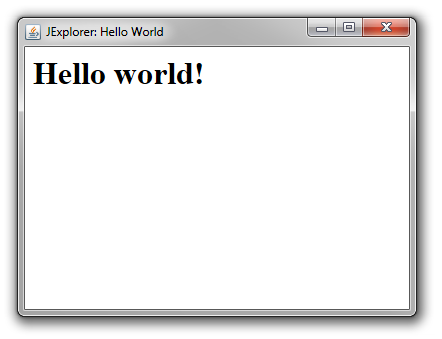 This simple example above shows how to create a Browser component, embed it into Swing container, display it and load the "<html><body><h1>Hello world!</h1></body></html>" HTML string directly into the Browser. By default timeout is set to 15 seconds. You can change default value via jexplorer.ipc.timeout.seconds system property or com.teamdev.jexplorer.internal.ipc.LatchUtil.WAIT_SECONDS. This method doesn't wait until HTML content is loaded and displayed completely. To find out when it's loaded see Loading URL. In your DialogHandler implementation you can display your own customized dialogs. To get default MS IE user-agent string use the Browser.getDefaultUserAgent() method. JExplorer provides DOM API that allows working with DOM of the loaded web page. You can access document, go through DOM structure, read HTML elements and their attributes, modify DOM structure, etc. The BrowserLogger is used to log browser messages. The IPCLogger is used to log IPC (Inter-Process Communication) messages. The ProcessLogger is used to log messages that are come from JExplorer.exe process. By default the log level for all JExplorer loggers is set to Level.ALL. You can redirect log messages of any JExplorer logger: BrowserLogger, IPCLogger or ProcessLogger. You can find more information about how to use JExplorer library at JExplorer Support Site. If you would like to discuss any topics related to JExplorer, please visit our Support Forum. Copyright © 2002-2017 TeamDev Ltd.